Secular Pro-Life Perspectives: McFall v. Shimp and Thomson's Violinist don't justify the vast majority of abortions. McFall v. Shimp and Thomson's Violinist don't justify the vast majority of abortions. Many people argue that abortion is justified because of bodily rights. 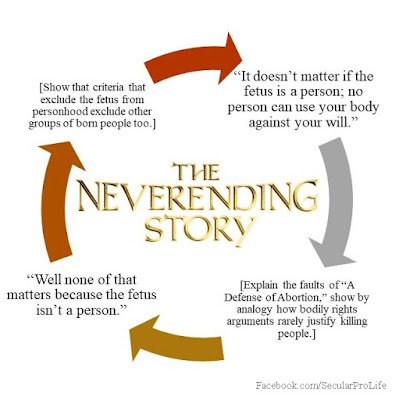 The idea is that it doesn’t matter if the fetus is a person or not, because no person can use your body against your will. If that principle is generally true and generally applies to abortion, it makes sense to be pro-choice regardless of whether or not you think the fetus is a valuable human. People who argue that bodily rights are paramount sometimes point to the court case of McFall v. Shimp. This isn’t a huge court case—it wasn’t the Supreme Court, it was the Court of Common Pleas in Pennsylvania—but it’s an important case because of the unique case elements. Morally, this decision rests with the Defendant, and, in the view of the Court, the refusal of the Defendant is morally indefensible. For a law to compel the Defendant to submit to an intrusion of his body would change every concept and principle upon which our society is founded. In other words, even though Robert McFall was clearly a person with as much moral worth as you and I, and even though he would die without this bodily donation, the Court would not compel Shimp to donate to McFall. And McFall did die shortly thereafter. So if we can’t compel someone to give of his body to save Robert McFall, how can we compel someone to give of her body to save a fetus? Another example of this idea is a thought experiment by Judith Jarvis Thomson. She wrote an essay called “A Defense of Abortion” in which she argued that we need not debate whether the fetus is a person because abortion is justified anyway. 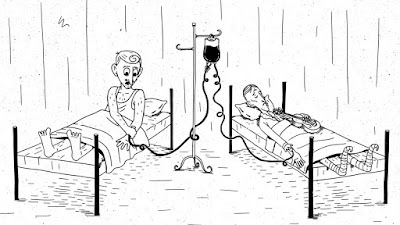 To illustrate her point, she asks you to imagine you wake up one day in a hospital bed and your circulatory system is hooked up to a man in the bed next to you. You learn this man is a very talented and famous violinist with a fatal kidney ailment, and his fans--the Society of Music Lovers--have somehow reviewed all available medical records and learned that you are the only person with the right kidney or blood type to filter the poisons from the Violinist’s blood. So the Society of Music Lovers kidnaps you, knocks you out, and attaches you to the Violinist. The hospital director enters the room and says he is terribly sorry—if he had realized what was happening he would have never allowed it. Nevertheless, you’re now attached to the Violinist and if you unplug, the man will die. But if you stay plugged in for nine months, the Violinist will be cured and you can each go on your way. Thomson then asks if it is morally required of you to stay plugged in to the Violinist. And even if it is morally required, should it be legally required? Most people intuitively think it should not. They agree it would be a heroic act if you stayed hooked up to the Violinist, but they don’t think such an act should be legally required. I agree with both the real life example of McFall v. Shimp and the hypothetical example of the Violinist. I don’t think Shimp should have been legally required to donate to McFall, and I don’t think you should be legally required to stay hooked up to the Violinist. And yet I still think most abortions should be illegal. Is that a contradiction? McFall v. Shimp and The Violinist are not analogous to abortion; if they were I would think bodily donation should be required in those cases too. 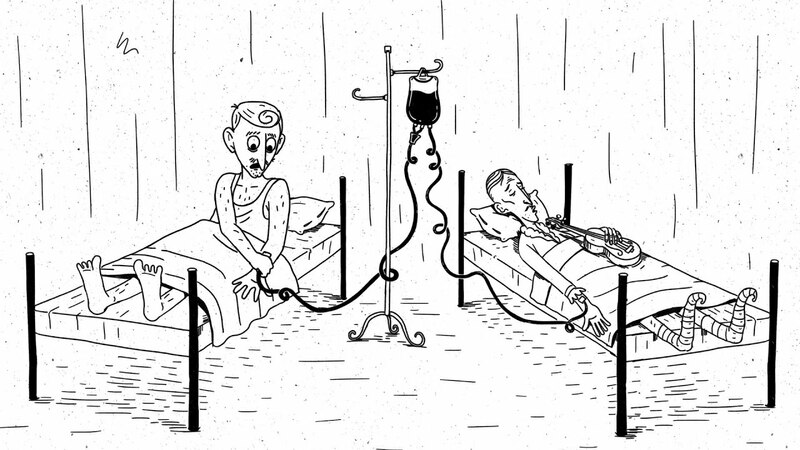 If you refuse bodily donation, someone else will die. You chose to risk making this person’s life depend on you. No one else can save this person. Your bodily donation is temporary. Your refusal means actively killing this person, not just neglecting to save him. Some suggest that last factor is being too nitpicky. If the person is going to be dead either way, what difference does it make whether you neglect to save him versus actively kill him? It makes a great deal of difference. It’s the difference between watching someone drown while refusing to try to rescue him versus holding him underwater until he dies. It’s the difference between unplugging from the Violinist and letting him succumb to his kidney ailment versus shooting him in the head. We recognize both socially and legally a great difference between actively killing someone versus simply neglecting to save him. And the main point here is that most forms of abortion actively kill humans, rather than simply fail to save them. Shimp refused to donate bone marrow, and McFall died. And bone marrow donations are temporary in the sense that you can regenerate bone marrow. Shimp had nothing to do with the fact that McFall's life was in danger. (And even though Shimp was in no way responsible for McFall's condition, the court still found Shimp's refusal to donate "morally indefensible.") Additionally, in coming to a ruling, the Court discussed the fact that there could be an unrelated person out there who was a bone marrow match. (If you’re interested in potentially saving lives through bone marrow donation, please check out BeTheMatch.org.) Finally, Shimp neglected to save McFall; he didn't actively kill his cousin. If McFall v. Shimp were truly analogous to abortion, it would involve Shimp making a decision that he knew could endanger McFall. Say there was some button Shimp could press that made him feel wonderful; he knew pushing the button involved the remote chance that McFall would contract a fatal ailment only Shimp could save him from. Still, Shimp figured the chance was too small to worry about, and so he pushed the button anyway. Then McFall did get a fatal illness, and he reached out to Shimp to save him. Shimp declined ...and then shot McFall in the head. That’s abortion. In the thought experiment, you didn’t choose to risk the Violinist’s life, nor did you choose to hook yourself up to him. In fact a major aspect of the story is that you were kidnapped and hooked up to the Violinist against your will. You very specifically had no choice in the matter. Furthermore you don’t kill the Violinist. You are choosing whether or not to unplug from him and let him succumb to his ailment; you’re not choosing whether to smother him with a pillow. When bodily rights arguments are adjusted to include all five criteria, they become pretty unpersuasive. At best the conclusion sounds incredibly immoral, and at worst it also sounds very illegal. Roe v. Wade actually ruled that the government can outlaw abortion after a certain point in the pregnancy, meaning the government can compel bodily donation to keep another alive. In fact in an article analyzing McFall v. Shimp and whether we should always say bodily rights trump saving lives, FE Huffman cites Roe v. Wade as precedent for compulsory bodily donation. 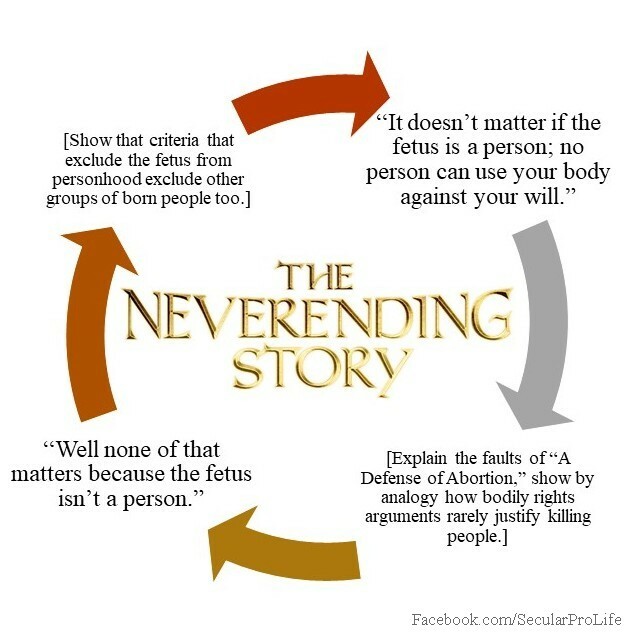 If your response to all this is that these analogies overstate the case because the fetus isn't a person, you're implicitly demonstrating my point: bodily rights arguments work only if the fetus isn't a person. If the fetus is a valuable human being, the "my body, my choice" train of thought isn't nearly strong enough to justify abortion. We have now completed half of this cycle. Consider the fact that most Americans believe abortion is justified only at earlier stages of pregnancy or only under more severe circumstances. If you believe elective abortion should be illegal at later stages of the pregnancy, your stance implies bodily right are not sacrosanct. For people who view the embryo and fetus as morally valuable humans from the beginning, bodily rights don’t even come close to justifying the vast majority of abortions. *During oral arguments the justices and plaintiffs suggested that if we recognized the fetus as a person under the 14th amendment, it would be almost impossible to justify legal abortion. Remember that background when people claim Roe v. Wade remained neutral on the question of when life begins. ERI Bodily Rights Materials - a whole collection of thoughtful articles by the Equal Rights Institute related to bodily rights arguments.